If you will ask any woman about the best & absolute source of her fashion inspiration, you will only hear one word ‘Bollywood’. The tinsel town never stays behind & calm when it is about latest fashion trends & hacks. Be the bride of your dream by checking out these sassy beauties in ravishing wedding lehengas!!! To buy wedding lehenga comes with a lot of pain and hard work to get the attire of your dream wedding. It’s not something going to market & grabbing any ordinary lehenga. First, you need to know about your personal style and what suits you best and goes with your individual personality. Then you must be updated with the latest fashion trends & what you can add to beat the trend. All these steps can be done at once if you draw inspiration from the bridal looks of most gorgeous ladies of the world & make them work for your own style. It’s time to win everyone with your enchanting & gorgeous bridal look!!! The world is chasing her for her flawless looks & phenomenal acting talent. This Marsala wine hued lehenga has been in talk since she has worn it in Manish Malhotra Bridal collection. Check out online lehengas and pick this royal staple for your forever undying look!!! When the cuteness is overloaded with the classic traditional outfit & jewellery, nothing can beat the charm and grace. Parineeti Chopra looks like the bride of a dream of various women. Her beautiful Indian features adorned with traditional Indian style jewellery and typical bridal colour lehenga has taken her beauty to another level. It’s time to replace your plain lehenga style with the heavy embellished ones for your big day. Magenta can talk about your both charming & bold appeal at the same time. Have a look & decide!!! When the most admirable lady of the town slips into something, everything else fades away. This Sonam Kapoor’s off white & golden lehenga can make you the bride of the season and make you stand apart for your exceptional choice of colour & style. 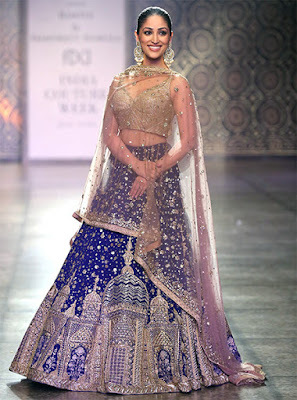 If you want to be the most stunning & sassy bride of the town, fall for this royal blue bridal wear!!! This ravishing lehenga can do wonders to your complete persona and beyond needed to turn heads around. Buy wedding lehenga which goes best with your own individual style & make you the bride of the era!! !